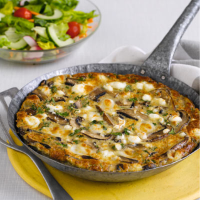 Flavourful mature mushrooms are classically matched with garlic and goat’s cheese in this protein-packed frittata. 1. Spray a large non-stick frying pan with oil and stir-fry the mushrooms and garlic over a high heat for 5 minutes until softened. 2. In a large bowl, beat the eggs well. Add the garlic mushrooms and any juices from the pan. Stir in the breadcrumbs and parsley. 3. Wipe the pan clean with kitchen paper and spritz lightly with oil. Pour in the egg mixture, scatter over the cheese and cook very gently for 10 minutes until almost completely cooked through. 4. Cook under a preheated grill for a further 5 minutes or so until golden brown and completely set. Cut into four and serve at once with the garden salad.